Are you interested in ships and the history of the naval fleets? 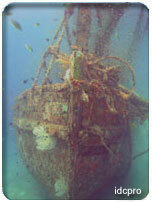 Have you ever wondered what it would be like to stand on the deck of a sunken ship at 30 meters? Have you ever wanted to dive a wreck but didn't feel that you could do it safely? If you answer yes to any of these questions then you should enroll on a PADI Wreck Diver Specialty Course!!! The PADI Wreck Diver Specialty Course is designed to familiarize you with the skills, knowledge, planning, organization, procedures, techniques, problems, hazards and fun of wreck diving. The course will serve as a safe, supervised introduction to wreck diving. During the course you will develop the ability to explain the historical value of wrecks, the social and moral issues surrounding them and local and national laws regarding wrecks around the coast of your own country. You will know how to research a wreck to find its history and background, and you will also know how to plan and organize your wreck dives to make them as safe and fun as possible. You will be able to identify the potential hazards and dangers of a wreck so avoiding any chance of injury or accident. These will include being able to identify the dangers and hazards of a wreck penetration dive and the procedures required to minimize those hazards. If you've never been interested in ships before, you will be after completing the PADI Wreck Diver Specialty Course. Once you've been introduced to wreck diving, you'll never look back. This is a fascinating specialty course which is guaranteed to give your diving a new goal!! !